"Nakakahiya Kayo" Ira Panganiban addresses to ABS-CBN! Home / News / "Nakakahiya Kayo" Ira Panganiban addresses to ABS-CBN! Everyone was indeed shocked when the campaign ad that hits on the Davao City Mayor Rodrigo Duterte was aired on the ABS-CBN Network. The said network earned a lot of bashers and negative comments after they agreed to air the said TV ads that features children. In the said TV ad, children were used to tell everyone that Duterte isn't a good example for the children and that he'll never be a good leader of the Philippines. Now, a former employee of the ABS-CBN wasn't able to contain his emotions after this TV ad was shown on Tv. 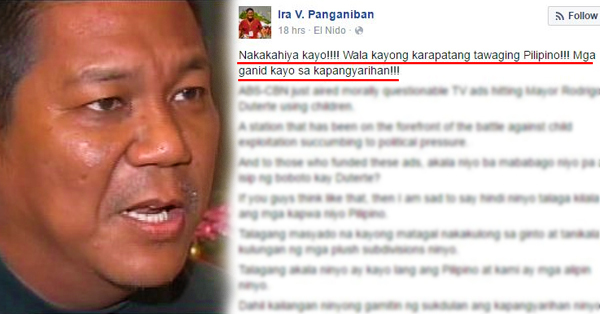 Ira Panganiban posted an open letter that was addressed to ABS-CBN. Up until now, there were no clarifications and statements yet that were released by ABS-CBN. Their camp has remained silent ever since this issue has started.